Appearance: Color is a pale gold. Clarity is cloudy as you’d expect from a witbier. Nice white two-finger head that receded slowly leaving very little lacing. Smell: Very appealing. Good mixture of spices are very dominant; cloves, coriander and vanilla. Those traditional Belgian White Beer citrus notes are right there balancing the spices helping to create a damn good smelling beer. Has a bit of a grainy/ alcohol ester smell in there as well. Initial Taste: Delicious. The baseline of wheat and grains are there to carry you into the waves of citrus and spice. Much more flavor than I expected from a witbier. Lots of yeast. Citrus and coriander spice are balanced to near perfection creating a witbier that is high in flavor and high in drinkability. Slightly tangy citrus finish. Thoughts: This unassuming bottle of Double White Ale is a unique take on Belgian White Beer (witbier). 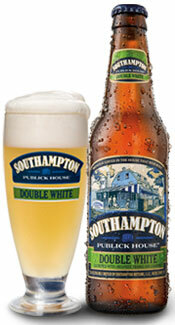 This golden beauty is the beer-child of Southampton Publick House Brewery. They created this double style beer to add more than just alcohol to this Belgian style beer. They doubled up on all the flavors – “more complex orangey/citrusy fruitiness, a slightly fuller body, more alcohol and a more satisfying finish”. They achieved this perfectly. This Double White offers what other witbiers can not, lots of flavor with high drinkability. This has jumped to the top of my list of favorite witbiers. Highly recommend. Cheers!